At the Joseph Smith Academy, the city beautiful and its residents of yesterday come alive, stimulating new growth—of mind and spirit—in today’s students. There aren’t many convenient ways to get to western Illinois. Sizeable airports and modern freeways are scarce. Country roads, propeller planes, and the mighty Mississippi serve as the main facilitators of travel in these parts. But maybe that would have been different had things continued as they began in 1839. Between 1839 and 1845 the river-bound wooded flatland of Hancock County drew settlers faster than most areas of the United States, especially around a small town once known as Commerce. 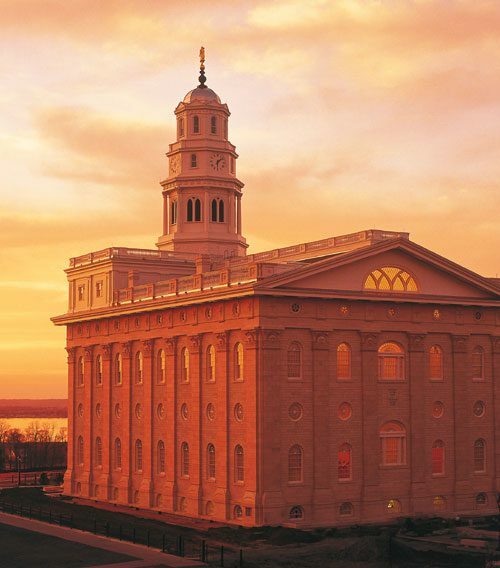 Renamed Nauvoo—Hebrew for “beautiful”—in 1839, the town grew from about 2,400 settlers in 1840 to more than 11,000 inhabitants in 1845, with thousands more residing in the local environs. The city was a flurry of activity, and the flats—the lowland along the river—bustled with construction, farming, and religious work. But all that activity stopped suddenly in early 1846 with the expulsion of the Saints, and by 1850 Nauvoo’s population was just 1,141. Nauvoo today is about the same size it was in 1850, a quiet midwestern farming town. 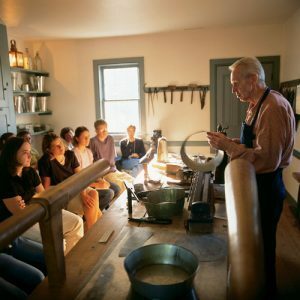 In recent decades, some of the activity of former years has returned—at least during the tourist season—with visitors flocking to the bend in the Mississippi to learn about pioneer life and Mormon history in buildings and homes restored by The Church of Jesus Christ of Latter-day Saints. And now from up on the bluff come sounds of productivity as a white-walled temple rises from literal ashes. For a generation or more the temple lot has been a grassy rectangular depression in the earth. Here early Saints toiled and sacrificed, working quickly to complete their temple before being forced westward. Fire and tornado later destroyed the structure. On the vacant temple lot in the late 1900s, a small-scale model of the temple reminded the thousands of faithful pilgrims of what was and what might have been. On this late-fall morning, however, it’s as if someone added water to that model and it grew. Looming above trees and buildings, the reconstructed temple attracts attention from most anywhere on the flats or the river. A ring of scaffolding circles the tower and a crane stretches skyward. Up the face of the cement structure, white stone rises, each column founded on a moon stone and topped with a sun stone. A golden angel Moroni raises his trumpet atop the tower. The building is imposing and beautiful, a monument to the faith of those who built the original structure, a house of worship for those who rebuild it now. A covered walkway in front of the Joseph Smith Academy gives students in BYU’s Semester at Nauvoo program front-row seats for the reconstruction of the Nauvoo Illinois Temple. “This is the greatest study hall, a place to sit and watch th etemple being built,” says Jessica D. Smith, ’03. Previous page: Along the banks of the Mississippi, Nauvoo hosts more than 200,000 visitors each year. Directly in front of the temple, on the crest of the bluff, a low, light-colored brick building bears the name “Joseph Smith Academy.” Originally a Catholic girls school, the building was purchased by the Church in 1998 and now houses BYU‘s Nauvoo study program. Here students immerse themselves in pioneer life and Church history. Here they spend a semester building testimony and gaining knowledge. Here, in the shadows of a covered walkway, they sit in white patio chairs and watch the temple grow. But live they will, and the professors encourage students toward the waiting buses. The Iowa-bound bus leaves Nauvoo, crosses the river, and makes its way into the countryside, in some places as flat as the frozen Mississippi, in others rolling like the folds of a rumpled quilt. Near the front of the bus, Adam L. Layton talks about the experiences that led him to Nauvoo. A senior at Arizona State University, he was registered for fall semester classes and ready to begin school when he heard about the Nauvoo program. He felt he needed to be here, so he dropped his classes at the last minute and came. Like Layton, many students have dates and places on their genealogy charts that trace the path of early Church history. And though mothers and grandmothers may have encouraged an interest in things ancestral, most students agree it didn’t catch on until they were here. That appreciation for heritage extends beyond blood relatives. Joseph, Hyrum, Emma, Brigham, Parley—figures of Church history are now known and referred to by first name. 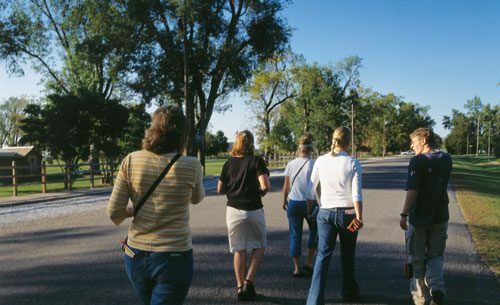 Walking the streets of Nauvoo, students come to regard this place as home. For nearly three months, they study, play, explore, and ponder, all the while learning about ancestors, pioneers, and the gospel. 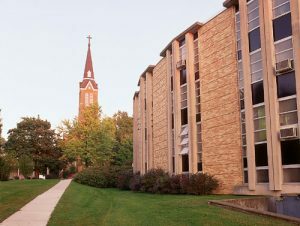 The students’ connection with early Saints grows through traditional study and personal experience. In October the students in the fall program walked from Nauvoo to Carthage in a re-creation of Joseph Smith’s June 1844 journey. “It was a bonding moment between us and the early pioneers,” says Marjorie J. Rapking, ’05, a history major from Lost Creek, W. Va. Such moments of discovery and connection are frequent. As they visit the flats and walk through the homes of Brigham Young, Wilford Woodruff, John Taylor, and Joseph Smith, their love grows for the prophets of God. As they make candles and bricks and knit scarves, they come to understand something of daily life in 19th-century America. As they huddle together on a green hill in central Iowa, nipped by a chilling November wind, they feel compassion for the 1846 Saints who slogged across half a state in snow and mud and here rested in a place they called Garden Grove. In the Stoddard Tin Shop, a missionary teaches students mid-19th-century craftsmanship. Besides their professors and food-service missionaries, students also interact regularly with the 100 other senior missionary couples serving in Nauvoo. For six years Garden Grove was a way station for Saints headed west. Some stopped and stayed for years. Now, like many Church history sites on the students’ itinerary, Garden Grove is a farmer’s field, an expanse of green grass sliding from plain to hill, bordered by leafless trees. At Garden Grove, across Iowa, and throughout the Nauvoo experience, the students understand better the hardships encountered in early Church history. They come to appreciate more their spiritual heritage and the people behind it. It is Friday afternoon, and after a morning visit to Winter Quarters and a few hours on the bus, students kick through fallen leaves on Spring Hill in Adam-ondi-Ahman, Mo. Scraggly tree branches cast shadows across the leaves and grasses and a light breeze comes from the direction of the sun and the Grand River on the other side of the valley. At the crest of the hill, students study a plaque, survey the landscape, and talk about Adam-ondi-Ahman. A few gather around Jerry C. Roundy, ’60, one of their professors, and ask questions about what happened here and what will happen here. Others laugh and joke. Cameras come out and someone pulls Roundy into their photo. The structure and facilities of the program, combined with the social environment of a small town, foster such a tight-knit community. One building houses student and faculty dormitories, the cafeteria, classrooms, the game room, the library, and computer labs. And everyone is studying the same thing. All students take Church history and the Nauvoo teachings of Joseph Smith. With only half a dozen other classes to choose from, students share homework woes, test agony, and study groups. Through skills learned in the Nauvoo Pioneer Life class, students also share a new hobby. In front of TVs, at firesides, and on the bus, students—both male and female—pull out needles and yarn and knit or crochet scarves, mittens, blankets, caps, and leper bandages. They call it the Grandma Club. “Basically we don’t want any of our friends back home to see what we do here on Friday nights,” says Melissa Horsley, ’03, from Burley, Idaho, of the Grandma Club activities. The wives of a couple of the professors have become valuable resources for Grandma Club projects, and all of the faculty and their spouses regularly offer counsel, friendship, and listening ears. “Going to Joseph Smith Academy is like going to school with your grandparents—really cool grandparents,” says Melanie D. Lenehan, ’03, a math education major from Cameron Park, Calif. Those grandparents include professors and the missionaries that work in the academy cafeteria as well as some 100 other senior couples that serve missions in Nauvoo. As they often do, students study and ponder among the tall trees in the “groves,” just downhill from the temple and the Joseph Smith Academy. Joseph Smith frequently taught the early Saints in groves like this one. The Nauvoo program began in winter semester of 1994 with about 40 students and four faculty members living in homes scattered around Nauvoo. When the Church purchased the building for the Joseph Smith Academy, the program expanded and now operates two semesters a year, housing up to 120 students at a time. 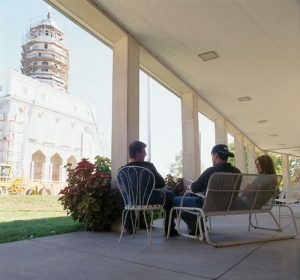 Based on the model of the Jerusalem Center for Near Eastern Studies, the Joseph Smith Academy welcomes college-aged students from all over; usually about 40 percent of the participants each semester are BYU students. The bright Saturday-morning sun warms the students sitting on the grass of the temple lot in Independence, Mo. They are gathered around Dahl, who stands near a cement marker in the grass that reads “Second Stone of Temple.” One city block to his left, the Community of Christ (formerly the Reorganized Church of Jesus Christ of Latter Day Saints) temple spirals nearly 200 feet into the air. The significance of such stories is not lost on the students. A month ago they traveled east to visit Kirtland. Now they’ve been on a bus for two days and have ended up in Independence. The distance means something to them now. And so does the sacrifice. David R. Willmore, ’74, a member of the Nauvoo faculty, says being on site makes a difference in the student’s learning experience. In most teaching situations, he says, one of the biggest challenges is motivating the learner. That’s not a problem in Nauvoo. “They read the book—in fact, they’re having a love affair with it. And if I make a statement that is different from the book, they say, ‘Well, Brother Willmore, it says here . . .’ and I have to backtrack. I have to be super prepared here, because they are,” says Willmore, who taught for more than 35 years in the Church Educational System. In explaining the increased motivation, students regularly mention the Spirit. They also refer to enthusiastic teachers and the synergy of a hundred hungry minds. And then there’s the value of seeing with their own eyes the buildings, the hills, the rivers, and the plains where it all happened. Lori C. Newbold, ’05, sits near a window in Carthage Jail. During the course of the semester, students go on field studies to other sites in Illinois and to New York, Ohio, Missouri, and Iowa. So the students’ understanding grows—understanding of people and places and doctrines. As they sit in the Kirtland Temple and sing “The Spirit of God,” they gain appreciation for what it means to be in a house of the Lord. As they stand in the upper room in Carthage Jail, on the same wooden floor on which Joseph Smith stood, they receive insight into the testimony of a prophet. As they walk through the thick trees of the Sacred Grove, they grow in their knowledge of God. Back in Nauvoo, the two busloads of students greet each other enthusiastically and share stories and laughter over a late dinner in the cafeteria. Outside, the temple stands quietly in the dark Illinois night. Occasional cars drive by the temple and up the street past the grocery store and the Old Nauvoo Ice Cream Shoppe. “Old Nauvoo.” The descriptive moniker is everywhere. A few blocks away from the ice cream shop is the Old Nauvoo Antique Mall. 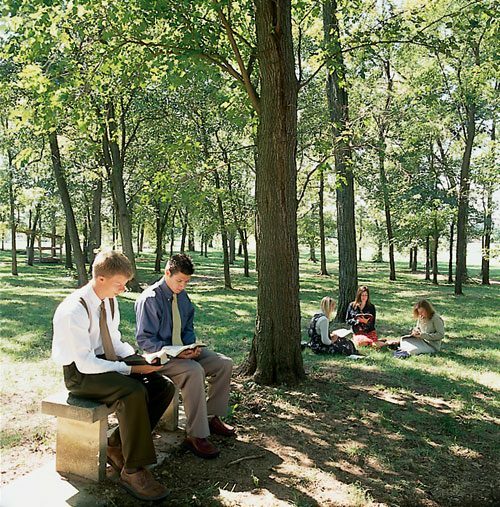 The students’ hands often turn the pages of In Old Nauvoo, one of their texts. Hotel gift shops peddle “Old Nauvoo” souvenirs. It seems everything about this place is looking to the past. info: For information about the BYU Semester at Nauvoo, see ce.byu.edu/ts/nauvoo.htm, send e-mail to debby_bennion@byu.edu, or call 1-800-525-2049 or 801-378-2048.